It is the time of year when the good veg. in the grocery stores seem limited to cabbage, squash, and sweet potato. I was looking for some way to combine sweet potato and radicchio, and the best option seemed to be making the sweet potato into gnocchi. Most of the recipes I read had added sugar, or maple syrup. This seems excessive as the sweet potato is usually sweet enough on its own. Prick the sweet potatoes all over with a fork and then bake in a 400 degree oven until tender, 40 minutes or so. Let cool, then peel and mash. Add the ricotta, egg, and salt to the mashed sweet potato and mix well. add two cups of flour and stir until thoroughly incorporated. The dough will be sticky. Add just enough of the remaining flour, in 1/4 cup increments, until the dough is workable by hand. Turn out onto a floured work surface, knead for two minutes or so, then divide into 8 equal segments. Set out a cookie sheet lined with parchment dusted with flour (or a Silpat, if you have one) and bring a gallon of water with two tbsp salt to a boil on the stove. Roll each of the 8 segments into a “snake” roughly 3/4″ thick. Cut into equal segments. Press each flat, then, with a floured fork, press lightly and roll into the traditional gnocchi shape. 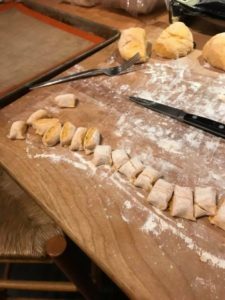 Set each gnocchi on the cookie sheet while you process the rest of the dough. 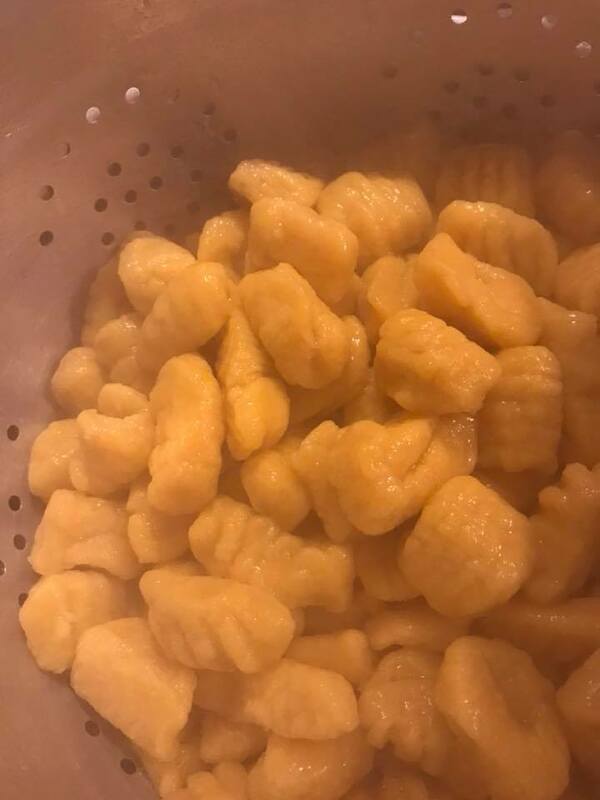 When the water is boiling, add all of the gnocchi at once. Stir gently to prevent them from sticking together and boil until cooked, 3-5 minutes. Drain. At this point, you can use them in any gnocchi recipe (pan sauteed with browned butter, sage, and garlic, for instance) or you can spread them on a cookie sheet, let them cool, and freeze them. To use the frozen gnocchi, thaw and either bake them or saute them. The sweet potato pairs well with bitter greens, like radicchio or broccoli rabe, and umami-rich flavors, like wild mushrooms. I baked mine in brown butter with radicchio, lamb sausage, and goat cheese. 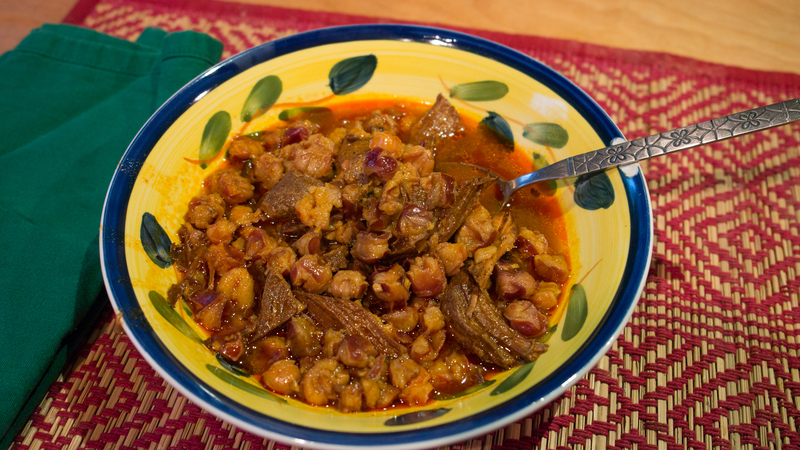 While I enjoy a good bowl of chili, I love posole more. Even though this stew cooks in a slow cooker, there is a lot of stovetop prep, too, this is a three pan meal, and expect to spend about an hour on prep. If using dried, the night before, wash the hominy well, then cover in cold water and soak overnight. The following day, drain the hominy, and place in a slow cooker. Cover with 3 quarts of boiling water, add the cumin, oregano, epazote, salt to taste, and cook on high until tender: 6 hours. In a dutch oven, heat 2 tbsp oil until shimmering, add the pork and brown on all sides. Chop one onion, add to the pork, and cook until tender. Cover the pork with water, salt to taste, and bring to a boil, then reduce heat and simmer until the pork is tender, 90 minutes or so. Remove the pork from the liquid and shred with two forks. Add the pork and cooking liquid to the hominy. Heat a dry cast-iron skillet until hot. Split and seed the peppers, then toast in the skillet, pressing down with a spatula and flipping each pepper once. They toast quickly, 10 seconds a side is usually sufficient. Toast the garlic in the skillet as well until the skins are slightly blackened and the garlic is fragrant. Peel the cloves and leave them whole. Place the peppers in a bowl, cover with boiling water and soak until soft, 10-15 minutes. Slice the onion in half and place directly over a gas flame to char, flipping once, 2-3 minutes a side. Chop. Put the peppers, garlic, onion, and tomatoes in a blender or food processor, add enough of the pepper soaking liquid so you can puree all of the ingredients. Strain the puree through a fine mesh strainer. Heat 2 tbsp oil in a skillet over medium heat until shimmering, pour in the chili sauce and cook stirring, until it darkens and thickens slightly, 10 minutes or so. Add the chili sauce to the hominy, stir well. Continue to cook until the hominy is tender. Taste for salt. Serve with fresh cilantro and sour cream for garnishes accompanied by warm flour tortillas.